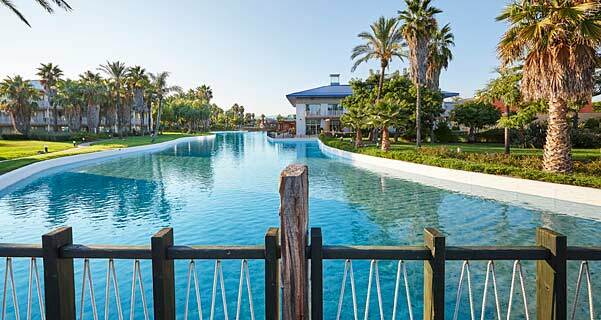 This hotel, located at the gates of Port Aventura, has a total of 497 rooms in 14 buildings grouped around a lake. The Club San Juan offers a separate reception area, a restaurant with an outdoor terrace and a private pool area. The centre of Salou is just 1.5 km away and has many shops and amenities. The nearest public sandy beach is about 2 km away. The Port Aventura theme park is 1 km away. The hotel also features volleyball and beach football courts, running track of 1.5 km and outdoor chess. Guests can enjoy over 30 attractions and up to 15 daily shows.